Regional lords (daimyō) in early-modern Japan were grouped into several categories based on their relationship with the shogunal Tokugawa house. The two largest categories of daimyo were fudai and tozama. Lords whose ancestors had proven their loyalty to the Tokugawa before 1600 were commonly known as fudai, while lords with more suspect allegiances were known as tozama, literally “outsiders.” This relationship between sixteenth-century lords and Tokugawa Ieyasu is well understood. Less clear is whether the terms tozama and fudai are meaningful for understanding political economy in later centuries. Many historians have observed constrasts in the investitures of tozama and fudai, although they describe this in different ways. The Kodansha Encyclopedia of Japan notes simply that “tozama generally held higher rank and larger domains than fudai” and that “fudai daimyō had smaller domains than tozama.” W.G. Beasley observed that tozama “predominated in the southwest and northeast of the country and included more of the very large domains than did the fudai” (Beasley 1960, 256). Jansen offered a fine-grained explanation. “Of the sixteen largest daimyo holdings, all but five were tozama. . . . in contrast to this, was the prevalence of petty, postage-stamp sized domains among the fudai. . . . most of them were without even a castle town and were close to the definitional limit for daimyo of 10,000 koku assessed productivity” (Jansen 2000, 42). Testuo Najita offered a more nuanced distinction, noting that some fudai were “assigned small- and medium-sized domains without significant military responsibilities,” but others were given “large strategic domains in regions with security responsibilities” (Najita 1974, 20). Harold Bolitho, by contrast, argued that by the 1800s there were few important differences tozama and fudai (Bolitho 1974). Data visualization and exploratory data analysis can help us to a clearer understanding of the tozama/fudai distinction. 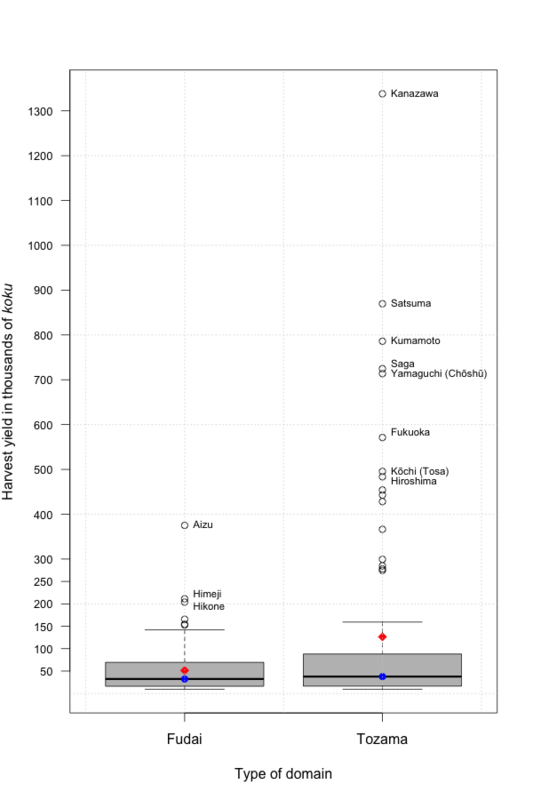 The analysis below relies on data from the early 1870s, compiled by the Meiji government as part of its replacement of domains with prefectures (for details see Ravina 1999). Figure 1 uses violin plots to compare the two types of domains by kusadaka, the annual harvest yield of the domains measured in koku of rice. The tozama distribution reveals a long tail, which skews the mean well above the median and the mode, but the lower halves of the tozama and fudai distributions are similar. Red diamonds mark the mean and blue circles mark the median. Kusadaka is an estimate of the annual harvest yield, using rice as currency of account. A koku is approximately 5 bushels or about 280 liters. What conclusions can we draw from these visualizations? The first is that the long tails skew not only mean values but our understanding of the distinction between tozama and fudai. The average kusadaka of a tozama domain was roughly 127,000 koku, more than double the size of the average fudai holding of 49,000 koku. But this difference was due to primarily to the presence of extremely large tozama domains, such as Kaga, Satsuma, Kumamoto, etc., with holdings over 500,000 koku. By contrast, there were no fudai with holdings that large. The medians of the two groups are thus quite close (approx 32,000 koku for fudai, and 38,000 for tozama) and the violin plot bulge are around the same points (estimated modes). Thus, large daimyo were overwhelmingly tozama, but those long tails tell us little about the vast majority of domains. Below 500,000 koku the distributions for tozama and fudai look extremely similar, and in both cases, most daimyo held less than 40,000 koku. Thus while we can assume a very large domain was tozama we cannot assume that a tozama domain was large. By extension, very large tozama domains were decisive in overthrowing the shogunate, but that tells us little about tozama in general. The converse holds for distinquishing features of fudai. Some fudai holdings consisted of many small, scattered parcels, and the most fragmented holdings were all fudai investitutes, but the vast majority of all domains consisted of one contiguous holding. Such seeming paradoxes are common. US Senators and NASCAR drivers are overwheingly white men, but the vast majority of white men are neither NASCAR drivers nor senators. Simple data visualizations, such as boxplots and violin plots, make it easy to avoid such inferential confusion. Violin plots use width to mark the number of observations at each level. The thickest part of the plot is the most common value, while thin sections mark less common values. 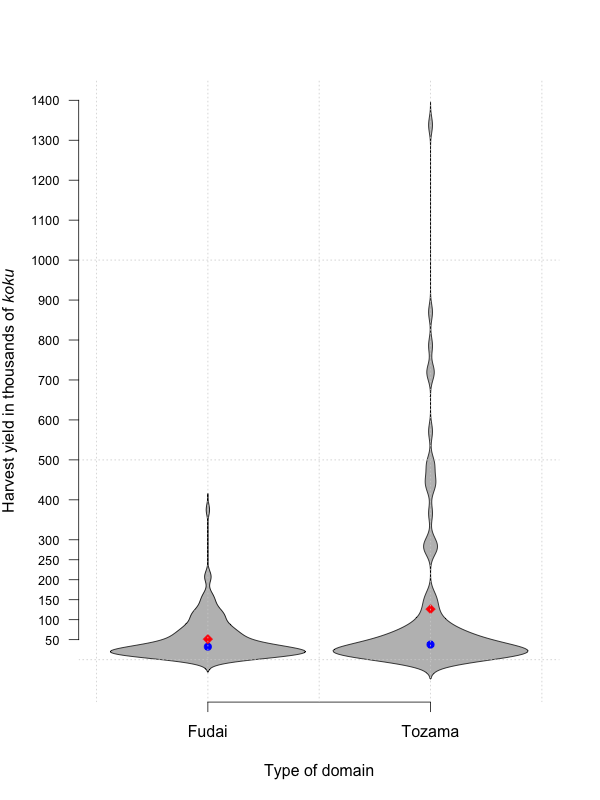 Technically, violin plots combine a box plot with a kernel density plot. Boxplots display a distribution using a “box” and “whiskers.” The box marks the middle 50% of the data, from the 25th percentile to the 75th percentile, a range called the interquartile range (IQ). The “whiskers” are dashed lines extending out from the box. They extend to the most extreme data point which is no more than 1.5 times the IQ (length of the box) away from the box. Points beyond the whiskers are outliers, and are marked with circles. Beasley, W.G. 1960. “Feudal Revenue in Japan at the Time of the Meiji Restoration.” Journal of Asian Studies 19 (3 May): 255-72. Bolitho, Harold. 1974. Treasures Among Men: The Fudai Daimyo in Tokugawa Japan. New Haven: Yale University Press. Frigge, Michael, David C. Hoaglin, and Boris Iglewicz (1989). “Some Implementations of the Boxplot.” The American Statistician 43 (1): 50-54. Jansen, Marius B. 2000. The making of modern Japan. Cambridge, Mass. : Belknap Press of Harvard University Press. McGill, Robert, John W. Tukey, and Wayne A. Larsen (1978). “Variations of Box Plots.” The American Statistician 32 (1): 12-16. Najita, Tetsuo. 1974. Japan. Englewood Cliffs, N.J.: Prentice-Hall. Ravina, Mark. 1999. Land and Lordship in Early Modern Japan. Stanford, Calif.: Stanford University Press. The visualizations are dramatic, true, but I’m not sure they actually reveal more than the standard calculations do: the disjunction between mean and median kokudaka would be fairly clear to anyone who actually looked at both numbers, and it’s not exactly a secret that the most politically active domains were wealthier, outliers. And with 250+ domains in a country the size of Japan, yes most of them are small. Thanks for your observations . . . it’s helpful to be pressed to clarify the purpose of data visualization (or data viz). I’m not sure that “the disjunction between mean and median kokudaka would be fairly clear to anyone who actually looked at both numbers.” Most English-language textbooks struggle to make that exact point. And the difference between the two distributions is not just mean vs. median: the difference in the tails, for example, is measured by kurtosis, a comparatively rare descriptive statistics. But that’s the goal of data viz: to make something obvious that “standard calculations” should make obvious, but don’t. John Tukey called this the “intra-ocular trauma test” – a good graph should hit you between the eyes. Fudai and tozama were roughly equal in number: in this data set there were 116 fudai and 95 tozama.